In this lively collection edited by Stephanie Feldman and Nathaniel Popkin, 40 novelists, essayists, poets, and artists confront the political division heightened by the Trump presidency and imagine a just future for the USA. “We are a people in a quandary about the present. We are a people in search of our future. We are a people in search of a national community.” This eerily familiar assessment was written by Congresswoman Barbara Jordan, in 1976, in the wake of Watergate and the failed and divisive presidency of Richard M. Nixon. 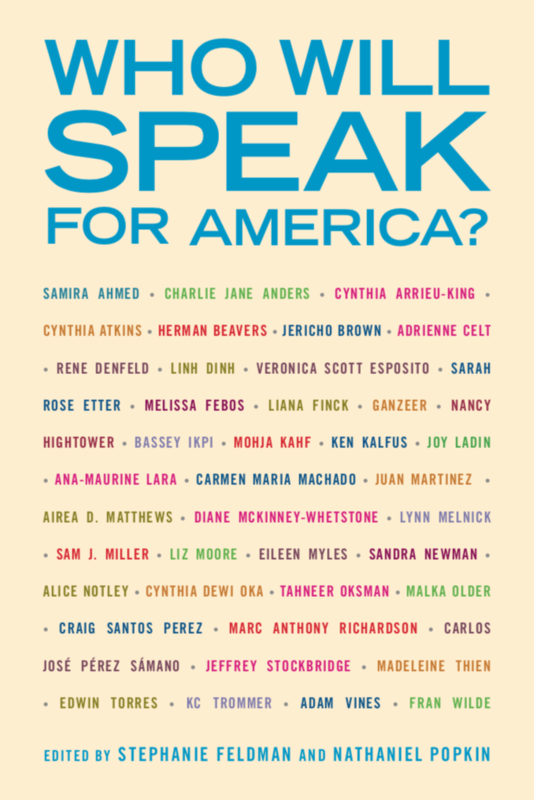 Jordan went on to pose a striking question to the nation: “Who then will speak for America?” More than forty years later, with American society now fractured, some of the nation’s most resonant literary voices join together in this volume to search for answers. The novelists, poets, artists, and essayists who contribute to Who Will Speak for America?—among them immigrants and refugees, men and women of color, gay and trans people, Christians, Jews, and Muslims—tackle the question of American identity and society, offering visions rooted in our history but attentive to our many possible futures. They confront the pain, confusion, and terror of the Trump era with resilience, bravado, reflection, and beauty. Speaking for America they beg you, the reader, to listen and respond. Listen to co-editors Stephanie Feldman and Nathaniel Popkin discuss Who Will Speak for America? on Aspen Public Radio’s First Draft. Listen to co-editors Stephan Feldman and Nathaniel Popkin discussing literature and the resistance on Book Fight. Listen to Nathaniel Popkin on Jefferson Public Radio’s Jefferson Exchange discussing Who Will Speak for America? and literature’s role in the resistance. “Timely and important, Who Will Speak for America? is a powerful anthology of essays, poetry, fiction, and art that grapples with our current political situation…Who Will Speak for America? will inspire thought, conversation, and possibly even political action.